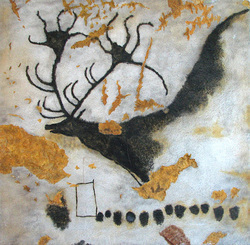 The cave paintings of Lascaux, France rank among the most significant works of prehistoric art. For me, they represent a conflicted sense of both the power of artistic expression and the fragility of humanity. It was my hope to present my reactions to these works honestly in my symphonic poem “Lascaux” for large orchestra. The work revolves around three ideas: a simple ostinato first heard in the harp, a solo violin melody, and an English horn melody. The ostinato represents the curves of the cave itself: supple and susceptible to change. The solo violin is a solitary female figure that is contrasted by the halting English horn’s awkward adolescent male character. These melodies are caught up in the sweeping rhythms of the heard that dominate the second half of the piece. Here the ostinato is transformed to become the powerful herds represented in the paintings. Ultimately, these three elements are brought harmoniously together in the resonant and forceful conclusion of the work.